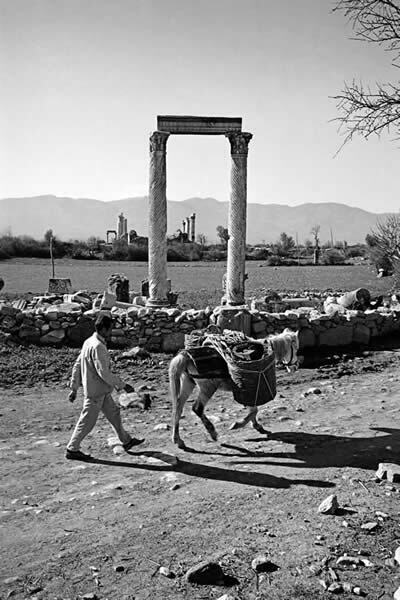 Interest in Aphrodisias has ebbed and flowed like the tide since 1961. Sometimes we await news of the ancient city with bated breath; other times we barely notice when it appears. We took the re-opening the newly refurbished Aphrodisias Museum on 24 October as an occasion for following up on the latest finds. This story is better known than the city itself. Dedicated to the goddess Aphrodite (Venus), and one of the chief archaeological sites of the Greek and Roman periods, it nevertheless lies off the beaten track. The excavations, which have been under way for years financed by the Geyre Foundation, culminate in new finds every autumn. But since they are stowed away, either in the Dig House or the Museum's storage area, few people are aware of them. 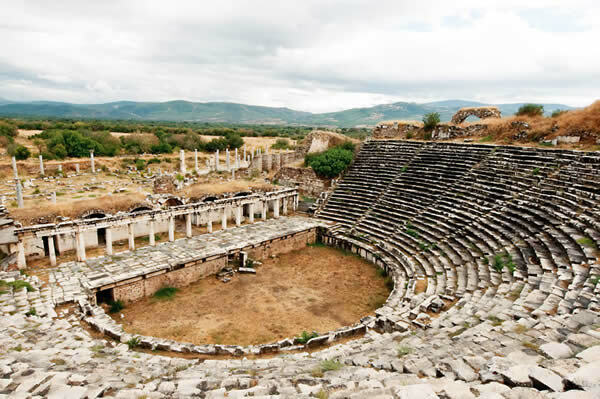 A scene of countless invaluable ruins, Aphrodisias up to now has been only about one-quarter unearthed. Another hundred years will be needed for completion of the task. Drawing attention last year for the opening of the Sebasteion Sevgi Gönul Gallery, the city is opening the doors of its newly refurbished museum on 24 October. We viewed the pre-opening preparations and the finds waiting behind the blue door of the Dig House for Skylife readers. There are a large number of reliefs and sculptures depicting Aphrodite in this city, which is known for its Temple of Aphrodite and ceremonies enacted in her name. Aphrodite, aka Venus, on the Half Shell is one of them. Currently undergoing work in the Dig House preservation and restoration areas, this sculpture has not yet been exhibited despite having turned up in the original. 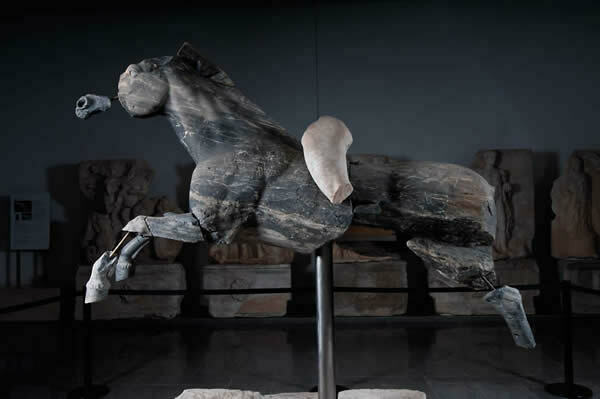 The 'Blue Horse' sculpture, which was found in the Civil Basilica during the 1970 excavations, finally went on display last year in the Sebasteion Sevgi Gönül Gallery after waiting many years in storage. Although only the upper part of the young rider's left leg remains, it is clear that he has been depicted falling off his horse. The work is important as the only example among ancient sculptures that depicts a galloping horse in marble. The Sebasteion, constructed in the mid-1st century A.D. in honor of the Roman emperors and the local goddess Aphrodite, is adorned with a marble panel of 200 life-size human figures in high relief. One after the other, some 80 of them have been on display in the Sebasteion Sevgi Gönül Gallery since 2008. But there are also examples in the Dig House that have not been displayed and continue to undergo restoration. These reliefs, whose subjects are varied and extensive, depict prominent figures and scenes such as Aphrodite and Troy. 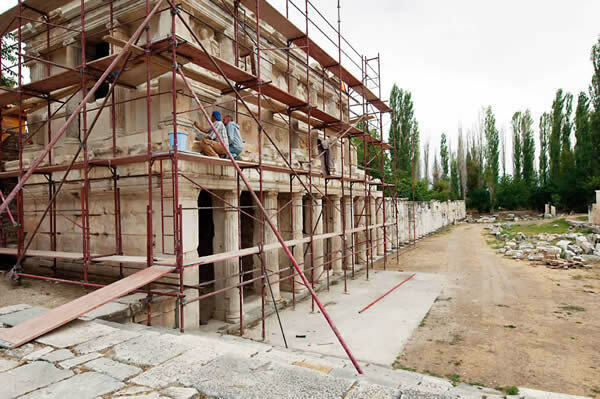 Built at the start of the excavations, the Aphrodisias Museum soon became too small to accommodate the richness of the ruins, so architect Cengiz Bektaş was asked to renovate it. 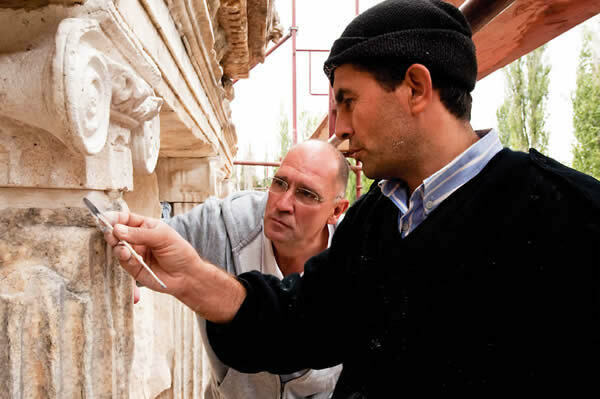 A project ongoing since February 2009, the Aphrodisias Museum is re-opening on 24 October. The reliefs and sculptures produced in the Aphrodisias School of Sculpture, which had its inception in the 1st century B.C. and continued its existence into the 5th century B.C. 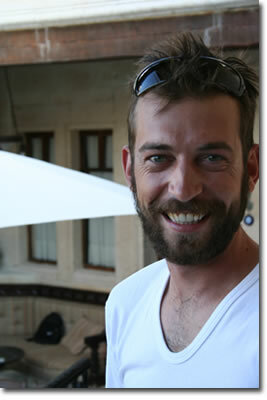 in the early Byzantine period, are world-renowned. A head of a 'Man Playing a Flute' is just one of many other examples that are waiting in storage. 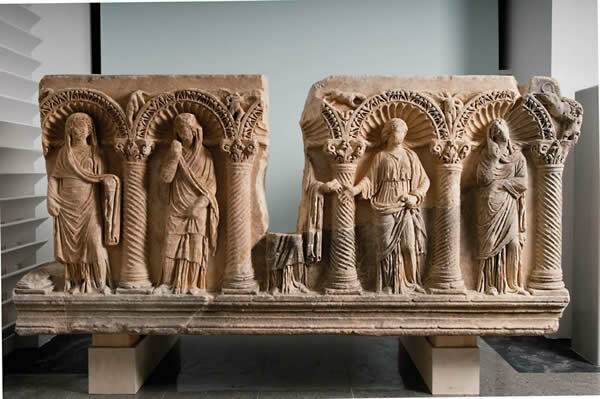 Among the works to be exhibited at the newly re-opened Aphrodisias Museum, the 'Weeping Women Sarcophagus' has never before been displayed. Restoration of the sarcophagus, which was found in pieces on the Eastern Necropolis in the 1994 excavations, has just been completed. On it, sumptuously dressed women are weeping and mourning. Another example of the same theme is on exhibit at the istanbul Archaeological Museum. 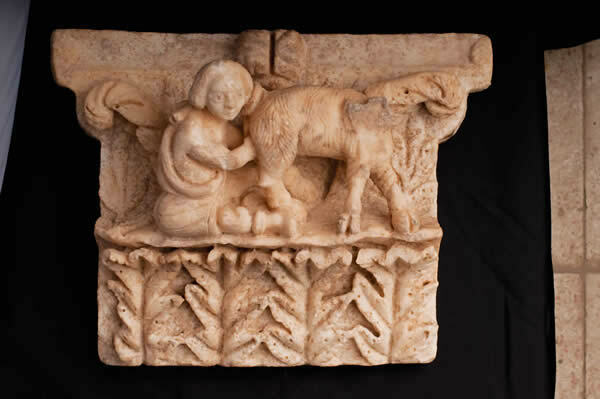 Another of the important pieces unearthed in the 2009 excavations is a marble column capital depicting a 'Villager Milking a Goat'. This capital, one of the prominent finds from the Late Roman period, is thought to have been made in the 4th century A.D. It was recovered in an area replete with marble encased walls, glass wall mosaics and murals on Tetrapylon Avenue between the monumental gate of the Aphrodite Temple's front courtyard and the entrance to the Sebasteion. Small items such as a stone game token, an oil lamp and a bronz shovel found in the recent excavations have been dated to the late 5th - early 6th century A.D. 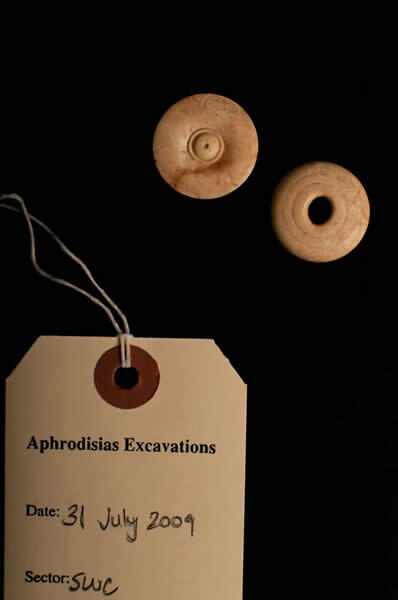 These artifacts, which were found below the floor level of the Aphrodisias Basilica corridor and removed to Museum storage, are important for giving an idea about life in the period. Artifacts such as a small bronze shovel, an oil lamp and a stone game token, which were unearthed in the 2009 excavations, have been dated to the late 5th - early 6th century A.D. These artifacts, found under the basilica corridor, have fueled speculation that there were settlements on the site. A pipe of baked clay was found during the excavations between the front courtyard of the Temple of Aphrodite and the entrance to the Sebasteion on Tetrapylon Avenue. In the same excavation some 800 coins were also recovered at the level of the Late Roman and Byzantine streets. This coins, which point to the existence of commercial life in the ancient city during the Ottoman period, have been dated to the 15th and 16th centuries. 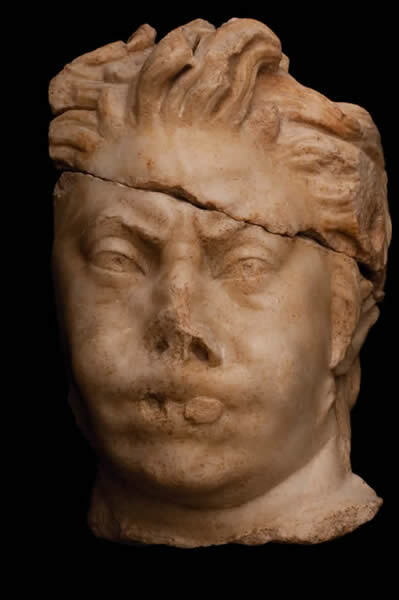 The New York University dig team found the head of a portrait sculpture dating to approximately 160-200 A.D. at the Aphrodisias Basilica. 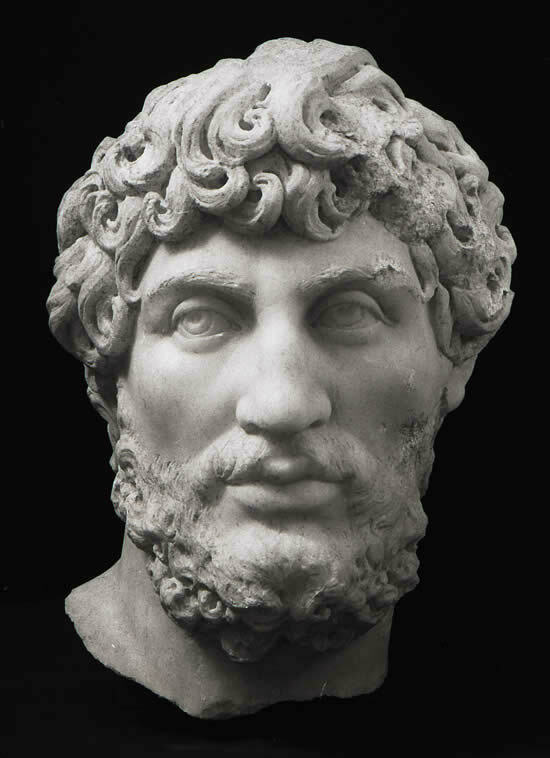 ‘Bearded Young Man’, who commands notice for his deeply carved curly hair, is important for masterfully combining the techniques of marble portraiture with an individual style. 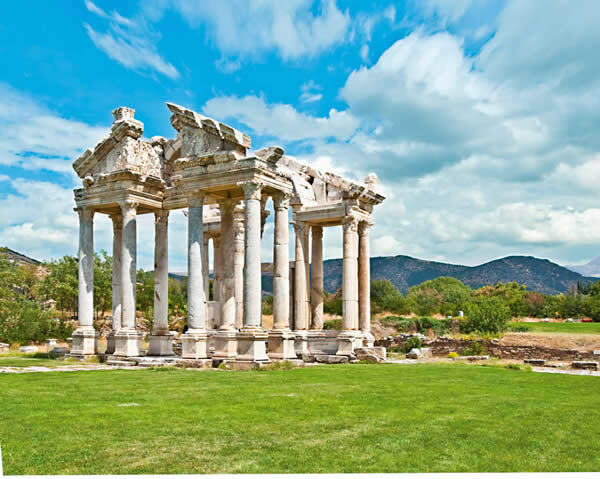 One of Aphrodisias’s most monumental structures, the Sebasteion is also known as the Temple of the Emperors. Efforts are under way to put this temple, a focus of current research and preservation work, back on its feet. Started in 2005, these efforts are expected to culminate in 2011. One of the finds from the Basilica’s south hall includes a pediment and, over it, an arch, wedged between the blocks that were toppled by a disaster in the 7th century A.D. Conservation and restoration of this piece, which was found in its original ruined state with all its fragments, continue at the Dig House. There are figures of two bulls and a roaring lion on the capital of the pediment, which exhibits an unusual design. 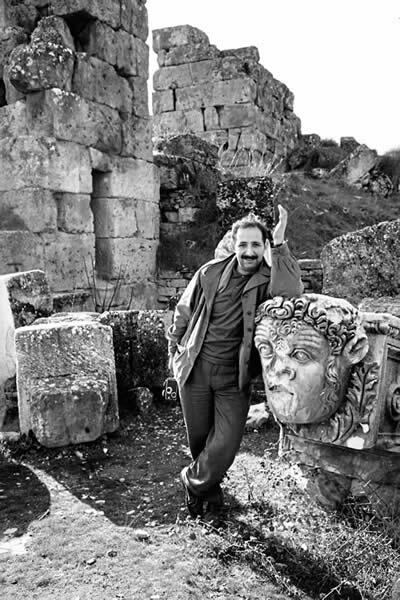 If Ara Güler hadn’t lost his way and photographed Aphrodisias in 1958 September and hadn’t sent these photographs to the Architectural Review and the Horizon magazine; this ancient city would have never drawn Prof. Dr. Kenan T. Erim’s attention and all that we are able to see today would remain buried under ground.